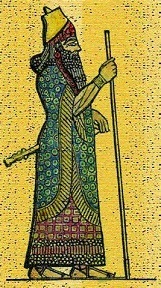 Sennacherib (ca. 705-681 B.C.) - After his father, Sargon II, died in battle, Sennacherib became king of Assyria. The first thing he had to do is quell opposition to his monarchy at home. Then he moved the capital of Assyria to Nineveh (where it stayed until it fell). Next, he suppressed rebellion in neighboring Babylon. His most famous campaign came against the Kingdom of Judah in 701 B.C.. This is the siege in which King Hezekiah and the prophet Isaiah participated (see Isaiah above). The Biblical account is confirmed by Assyrian records. Sennacherib kept a detailed inscription of his eight major military campaigns on a pillar called the Sennacherib Prism. It records the destruction of Babylon, the sack of Lachish and the siege of Jerusalem. On the fall of Lachish, Sennacherib lists the spoils of the city carried back to Nineveh. Of Jerusalem, he says he shut Hezekiah up "like a caged bird". However, there is no mention of the capture of the city, nor an explanation of why he failed to do so. The Bible attributes this failure to intervention by the God of Israel. "That night an angel of the Lord went out and put to death a hundred and eighty-five thousand men in the Assyrian camp. When the people got up in the morning - there were all the dead bodies! So Sennacherib king of Assyria broke camp and withdrew. He returned to Nineveh and stayed there." (II Kings 19:35-36). The Greek historian Herodotus also mentions Sennacherib, but says he met defeat at the hands of Egypt, perhaps because Hezekiah allied himself with Egypt before he rebelled against Assyria. And the Jewish historian, Josephus, quotes the work of Berossus who claims that Sennacherib's army fell to disease. In 681, he was murdered by two of his sons who were angry with him for destroying Babylon. He was succeeded by a third son, Esarhaddon.